Not to be confused with Trinity River (Texas). 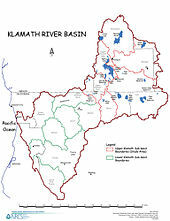 Map of the Trinity River and Klamath River watersheds. The Trinity River is shown in dark blue, with its watershed highlighted in dark yellow. The South Fork Trinity River extends southward, while the main Trinity River curves east then north. The Trinity River (originally called the Hoopa or Hupa by the Yurok, and hun' by the Natinixwe/ Hupa people) is a major river in northwestern California in the United States, and is the principal tributary of the Klamath River. 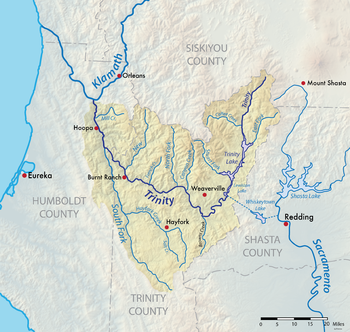 The Trinity flows for 165 miles (266 km) through the Klamath Mountains and Coast Ranges, with a watershed area of nearly 3,000 square miles (7,800 km2) in Trinity and Humboldt Counties. Designated a National Wild and Scenic River, along most of its course the Trinity flows swiftly through tight canyons and mountain meadows. The river is known for its once prolific runs of anadromous fish, notably Chinook salmon and steelhead, which sustained Native American tribes for thousands of years. Due to its remoteness, the Trinity did not feature prominently in the early European colonization of California, but the gold rush in the mid-1800s brought thousands of gold seekers to the area. The river was named by Major Pierson B. Reading who, upon reaching the river in 1848, mistakenly believed it to flow into the Pacific Ocean at Trinidad Bay. During and after the gold rush, the influx of settlers and miners into the Trinity River country led to conflict with indigenous tribes, many of which saw severe depopulation due to fighting and foreign diseases. In the following decades logging and ranching, combined with mining runoff, significantly changed the river's ecology and led to the decline of its fish populations. Today, the Trinity River is an important water source for irrigation and hydroelectricity generation, as well as a major center of recreational activities such as gold panning, fishing and whitewater rafting. Since 1964 the Trinity River has been dammed to create Trinity Lake, the third largest man-made lake in the state. As much as 90 percent of the upper Trinity River watershed was diverted for agriculture in the Central Valley. In 1991 environmental regulations were enacted, requiring a greater release of water to the Trinity River in order to protect fish. However, the use of Trinity River water remains a contentious issue, especially in years of drought. The Trinity River, looking north at Salyer. The silty South Fork joins the river from below. Swift Creek, in the headwaters of the Trinity River, is mostly fed by snowmelt. A Hupa man fishes at the "Sugar Bowl" rapids on the Trinity River, c. 1923. The abundant salmon, steelhead and sturgeon runs in the Trinity River were central to the lives of indigenous peoples along the entire length of the river. Fishing provided their primary sustenance as well as goods for trade. Prior to the arrival of Europeans, native peoples took as much as 2,000,000 pounds (910,000 kg) of salmon from the Trinity River each year. Native peoples also made meal of berries, seeds and acorns, and hunted game animals such as deer and elk that were drawn to the Trinity River. Weaverville Joss House is a Taoist temple built in 1874 by Chinese gold miners who settled in the Trinity River area. Another profitable way to access gold was hydraulic mining operations, which sprang up across the Trinity River country starting in the 1860s. At one point, there were 307 hydraulic mines in Trinity County alone, of which 145 were "fully operational", all of which depended on the use of pressurized water to demolish hillsides in search of gold bearing ore. This had an enormous impact on the landscape – leveling forests, carving huge gullies and burying streambeds under dozens of feet of sediment – which still characterizes the area today. Elaborate flume, reservoir and tunnel systems were built to supply the massive quantities of water required by these "hydraulicking" operations. Although settlers had been farming and ranching in the Trinity River valley since the beginning of the gold rush, the number greatly increased after the gold rush when miners decided to settle down and homestead in the area. One of the major ranching areas was the wide valley known as Trinity Meadows, which is now flooded by Trinity Lake. :15 The Webber family bought a ranch along the Stuart Fork in 1922 and established a resort. Having traveled in Europe, the Webbers thought the area resembled the Austrian Alps, and so named the mountains along the upper Trinity River the "Trinity Alps". :16 During the 1870s, the Southern Pacific Railroad was extended from Sacramento through Redding and would eventually reach Oregon, making travel to the area easier than ever before. As the 1950s began, demand on the Colorado River – which forms the border of California and Arizona and provided most of Southern California's water – was moving toward unsustainable levels. The Bureau of Reclamation restarted its surveys of the Trinity River basin as part of a larger proposal to move water from northern to southern parts of the state, and compensate for the shortages on the Colorado. The United Western Investigation, in 1951, proposed the damming of nearly every river in the North Coast region of California, chiefly the Trinity, Klamath and Eel. :265–271 The Ah Pah Dam would have flooded the canyons of the Klamath and Trinity Rivers to form the largest reservoir in California. These grandiose plans culminated in the Pacific Southwest Water Plan of 1964, which sought to comprehensively link the water systems of California and the rest of the Colorado River Basin. One of the key projects was an aqueduct to transport North Coast water to the Imperial Valley, reducing its reliance on water from the Colorado River. However, with the exception of the upper Trinity River project, none of these dam and diversion projects were ever realized. Forest and river habitats in the watershed have been heavily affected by human activities ever since Gold Rush mining began in the 1800s. Commercial logging has caused mountain slopes to become more prone to erosion; even in areas that are no longer logged and have seen secondary forest growth, abandoned logging roads pose a serious erosive threat. Grazing of livestock has also degraded grasslands and exposed soils to runoff. This has resulted in river channels becoming clogged and confined by sediment, harming salmon and steelhead populations by burying gravel bars used by these fish for spawning. Along the South Fork, this problem has been exacerbated by the inherently unstable rocks and soils of the Franciscan formation, causing mass wasting events that dump sediment into streams. Lewiston Dam blocks fish migration to the upper Trinity River. The Trinity River Fish Hatchery is located below the dam. ^ a b c d "Trinity River". Geographic Names Information System. United States Geological Survey. 1981-01-19. ^ a b c d e USGS Gage #11530000 Trinity River at Hoopa, CA: Water-Data Report 2013. National Water Information System. U.S. Geological Survey. 2013. Accessed 2017-09-30. ^ "Boundary Descriptions and Names of Regions, Subregions, Accounting Units and Cataloging Units". United States Geological Survey. Retrieved 2016-01-11. ^ "Trinity Lake Boating Safety Information and Map" (PDF). U.S. Forest Service. 2014. Retrieved 2016-09-20. ^ a b c d USGS Topo Maps for United States (Map). Cartography by United States Geological Survey. ACME Mapper. Retrieved 2016-01-11. ^ "Upper Trinity River Watershed Assessment Report & Management and Action Plan" (PDF). Trinity County Resource Conservation District. March 2006. Retrieved 2016-09-20. ^ "Shasta/Trinity River Division Project". U.S. Bureau of Reclamation. 2012-10-01. Archived from the original on 2016-09-28. Retrieved 2016-12-14. ^ "The Trinity River". California Water Impact Network. Archived from the original on 2016-03-25. Retrieved 2016-12-08. ^ "Mainstem Trinity River Watershed Analysis". U.S. Bureau of Land Management. Klamath Resource Information System. 1995. Retrieved 2016-01-11. ^ a b c d e Krause, Andreas (2010-07-01). "One Hundred and Fifty Years of Sediment Manipulation on the Trinity River" (PDF). 2nd Joint Federal Interagency Conference. Advisory Committee on Water Information. Retrieved 2016-12-04. ^ "Floods of December 1964 and January 1965 in the Western United States" (PDF). Geological Survey Water Supply Paper 1866-A. U.S. Geological Survey. 1971. Retrieved 2016-12-08. ^ "USGS Gage #11530000 on the Trinity River at Hoopa, CA". National Water Information System. U.S. Geological Survey. Retrieved 2016-12-08. ^ "USGS Gage #11523200 on the Trinity River above Coffee Creek near Trinity Center, CA: Instantaneous streamflow data". National Water Information System. U.S. Geological Survey. Retrieved 2016-01-11. ^ "USGS Gage #11525500 on the Trinity River below Lewiston Dam at Lewiston, CA: Instantaneous streamflow data". National Water Information System. U.S. Geological Survey. Retrieved 2016-01-11. ^ "USGS Gage #11525655 on the Trinity River below Limekiln Gulch near Douglas City CA: Instantaneous streamflow data". National Water Information System. U.S. Geological Survey. Retrieved 2016-01-11. ^ "USGS Gage #11525854 on the Trinity River at Douglas City, CA: Instantaneous streamflow data". National Water Information System. U.S. Geological Survey. Retrieved 2016-01-11. ^ "USGS Gage #11526250 on the Trinity River at Junction City, CA: Instantaneous streamflow data". National Water Information System. U.S. Geological Survey. Retrieved 2016-01-11. ^ "USGS Gage #11526400 on the Trinity River above the North Fork near Helena, CA: Instantaneous streamflow data". National Water Information System. U.S. Geological Survey. Retrieved 2016-01-11. ^ "USGS Gage #11527000 on the Trinity River near Burnt Ranch, CA: Instantaneous streamflow data". National Water Information System. U.S. Geological Survey. Retrieved 2016-01-11. ^ a b c d "Mainstem Trinity River Watershed Analysis" (PDF). U.S. Forest Service. December 1995. Retrieved 2016-09-20. ^ a b c "Trinity River Watershed Management Area" (PDF). North Coast Regional Water Quality Control Board Watershed Planning Chapter. California State Water Resources Control Board. February 2005. Retrieved 2016-09-20. ^ a b c d e "Natural Resources and Hazards". Humboldt 2015 General Plan Update. County of Humboldt. September 2002. Retrieved 2016-12-08. ^ a b c "Trinity River Restoration Program" (PDF). U.S. Bureau of Reclamation. 2000-12-19. Retrieved 2016-12-07. ^ "Water Resources". Humboldt County General Plan. County of Humboldt. Retrieved 2016-10-03. ^ "Hoopa Valley Tribe Sociocultural/Socioeconomics Effects Analysis Technical Report" (PDF). U.S. Bureau of Reclamation. July 2012. Retrieved 2016-12-13. ^ a b c Sawyer, John O. (2006). "Northwest California: A Natural History" (PDF). University of California Press. Retrieved 2016-09-27. ^ a b c d "Trinity River Basin Geology". Klamath Resource Information System. Retrieved 2016-09-27. ^ Irwin, William P. (2010). "Reconnaissance Geologic Map of the Hayfork 15' Quadrangle, Trinity County, California". U.S. Geological Survey Scientific Investigations Map 3119. U.S. Geological Survey. Retrieved 2016-09-27. ^ Hotz, Preston E. (1971). "Geology of Lode Gold Districts in the Klamath Mountains, California and Oregon" (PDF). Geological Survey Bulletin 1290. U.S. Geological Survey. Retrieved 2016-09-27. ^ Snoke, Arthur W.; Barnes, Calvin G. (2006). Geological Studies in the Klamath Mountains Province, California and Oregon: A Volume in Honor of William P. Irwin. Geological Society of America. ISBN 0-8137-2410-4. ^ a b "Lewiston-Dark Gulch Rehabilitation Project: Geology, Fluvial Geomorphology and Soils". Trinity River Restoration Program. U.S. Bureau of Reclamation. November 2007. Retrieved 2016-09-27. ^ a b "Formation of the Soils" (PDF). Soil Survey of Mendocino County, Eastern Part, and Trinity County, Southwestern Part, California. Natural Resources Conservation Service. Retrieved 2016-09-27. ^ a b "Trinity Alps Wilderness Management Plan: Draft Environmental Impact Statement". U.S. Forest Service. August 1995. p. 3. ^ "Whiskeytown Unit General Management Plan and Environmental Impact Statement". U.S. National Park Service. 1999. p. 61. ^ a b Sturtevant, William C. (1978). Handbook Of North American Indians: California. Government Printing Office. ISBN 0-16-004574-6. ^ United States Department of Energy (1981). Cottonwood to Elverta No.3 Transmission Line Rehabilitation Project, Shasta County: Environmental Impact Statement. ^ Nestor, Sandy (2004). Indian Placenames in America. 1. McFarland. ISBN 0-7864-7167-0. ^ "Hupa Online Dictionary and Texts". University of California Davis. Retrieved 2016-12-03. ^ Curtis, Edward S. (2015). The North American Indian, Volume 13: The Hupa, The Yurok, The Karok, The Wiyot, Tolowa and Tututni, The Shasta, The Achomawi, The Klamath. Native American Book Publishers, LLC. ISBN 0-40308-412-1. ^ "California Place Names of Indian Origin" (PDF). American Archaeology and Ethnology. Southern Oregon Digital Archives. 1916-06-15. Archived from the original (PDF) on 2011-07-20. Retrieved 2016-09-30. ^ "The Salmon Coast". On The Water. Smithsonian Institution. Retrieved 2016-12-12. ^ a b c Waldman, Carl (2014). Encyclopedia of Native American Tribes. Infobase Publishing. ISBN 1-4381-1010-3. ^ "Native American Influences". Trinity River Restoration Program. Retrieved 2016-11-30. ^ Waldman, Carl (2014). Encyclopedia of Native American Tribes. Infobase Publishing. ISBN 1-4381-1010-3. ^ a b c d Hoover, Mildred Brooke (1990). Historic Spots in California. Stanford University Press. ISBN 0-8047-1734-6. ^ Barbour, Barton H. (2011). Jedediah Smith: No Ordinary Mountain Man. University of Oklahoma Press. ISBN 0-8061-8324-1. ^ a b c d e Trinity Alps and Vicinity: Including Whiskeytown, Russian Wilderness, and Castle Crags Areas. Wilderness Press. 2010. ISBN 0-89997-580-1. ^ a b c "New River Backcountry" (PDF). U.S. Forest Service. June 2012. Retrieved 2016-12-03. ^ "Trinity Alps Gold Rush". California Department of Parks and Recreation. Retrieved 2016-12-03. ^ a b c d e f "The Search for Gold in Weaverville" (PDF). Trinity County Resource Conservation District. Retrieved 2016-12-03. ^ "Dimensions of the Cheops pyramid (Khufu's pyramid)". Building the Great Pyramid. 2006. Retrieved 2016-12-04. ^ "The Sawyer Decision: Legal Action Taken To Stop Hydraulic Mining!". Malakoff Diggins State Historic Park. Retrieved 2016-12-12. ^ "Hydraulic Mining in Northern California". Mining American. 55 (1): 335. 1907. ^ a b "Mining Information: Weaverville and Big Bar Stations" (PDF). U.S. Forest Service. Retrieved 2016-12-12. ^ Juillerat, Lee (2010-09-02). "At home in the woods". Herald and News. Retrieved 2016-12-12. ^ U.S. Fish and Wildlife Service (November 1980). Environmental Impact Statement on the Management of River Flows to Mitigate the Loss of the Anadromous Fishery of the Trinity River, California. U.S. Government Printing Office. ^ Associated Press (1988-11-23). "Judge Halts Logging Along Trinity River". Los Angeles Times. Retrieved 2016-12-12. ^ Kelly, R. K. (1988-12-10). "Land of Many Uses and Abuses". Los Angeles Times. Retrieved 2017-02-07. ^ Stene, Eric A. (1996). "Trinity Division - Central Valley Project" (PDF). U.S. Bureau of Reclamation. Archived from the original (PDF) on 2016-10-09. Retrieved 2016-12-05. ^ Reisner, Marc (1993). Cadillac Desert. Penguin. ISBN 0-14-017824-4. ^ "Pacific Southwest Water Plan" (PDF). U.S. Bureau of Reclamation. January 1964. Retrieved 2016-12-12. ^ a b "Diversion Facilities & Operations". Trinity River Restoration Program. Retrieved 2016-12-12. ^ a b "Summary of Volume and Diversion of Trinity River Water" (PDF). CALFED Bay-Delta Program. Retrieved 2016-12-12. ^ Bezis, Jason A. (2014-08-07). "Death of Sen. Clair Engle: Half century later". Red Bluff Daily News. Retrieved 2016-12-14. ^ "Senate Report 105-70". 105th Congress. United States Congress. 1997-09-02. Retrieved 2016-12-14. ^ Stene, Eric A. (1996). "Trinity Division: Central Valley Project" (PDF). U.S. Bureau of Reclamation. Archived from the original on 2016-09-28. Retrieved 2016-12-14. ^ "Trinity Powerplant". U.S. Bureau of Reclamation. 2011-04-04. Archived from the original on 2016-06-02. Retrieved 2016-12-12. ^ "Judge Francis Carr Powerplant". U.S. Bureau of Reclamation. 2009-05-13. Archived from the original on 2016-09-28. Retrieved 2016-12-12. ^ "Spring Creek Powerplant". U.S. Bureau of Reclamation. 2009-05-13. Archived from the original on 2016-03-05. Retrieved 2016-12-12. ^ "USGS Gage #11525430 Judge Francis Carr Powerplant near French Gulch, CA: Annual Water-Data Report 2013" (PDF). National Water Information System. U.S. Geological Survey. Retrieved 2016-01-12. ^ Hartridge, Anne M. "Salmon Medicine: Federal Trust, the ESA, and the Trinity River" (PDF). University of California Davis. Retrieved 2016-12-13. ^ Jones, Carolyn (2011-09-12). "Anger lingers over towns flooded by Trinity Dam". SFGate. Retrieved 2016-12-12. ^ a b c "Upper Trinity River Watershed Analysis" (PDF). U.S. Forest Service. March 2005. Retrieved 2016-12-12. ^ "Shasta-Trinity National Forest". College of the Siskiyous. Retrieved 2016-12-12. ^ "Mammals of the Shasta-Trinity National Forest" (PDF). U.S. Forest Service. Retrieved 2016-12-12. ^ a b "Diversion Impacts". Trinity River Restoration Program. Retrieved 2016-12-12. ^ "Trinity River Salmon Snapshots". The Nature Conservancy. Retrieved 2016-12-12. ^ "Upper Trinity River Population" (PDF). Final SONCC Coho Recovery Plan. National Oceanic and Atmospheric Administration. 2014. Retrieved 2016-12-12. ^ a b c Stokely, Tom (February 2015). "Federal Legal Opinion Favors Humboldt County's Claim on Trinity Water". Northcoast Environmental Center. Retrieved 2016-10-03. ^ Stokely, Tom. "The Trinity River: A Triumph of Science over Politics - For Now" (PDF). County of Trinity. Retrieved 2016-12-12. ^ "The Trinity River - A Trail of Broken Promises" (PDF). AquAlliance. 2012-11-29. Retrieved 2016-12-12. ^ "Trinity River Hatchery". California Department of Fish and Wildlife. Retrieved 2016-12-12. ^ "History of Trinity River Hatchery". California Department of Fish and Wildlife. Retrieved 2016-12-12. ^ "Historic Agreement Reforms Trinity River Fish Hatchery". Environmental Protection Information Center. 2014-04-28. Retrieved 2016-12-12. ^ a b Arthur, Damon (2011-12-01). "Trinity River advocates denounce restoration; network claims project poses harm to salmon". Redding Record Searchlight. Retrieved 2016-12-07. ^ "Trinity River "Restoration" Program Brought into Question in Coalition Letter". Environmental Protection Information Center. 2014-01-23. Retrieved 2016-12-07. ^ "Trinity River, California". National Wild and Scenic Rivers System. Retrieved 2016-12-07. ^ "South Fork Trinity River Population" (PDF). Final SONCC Coho Recovery Plan. National Oceanic and Atmospheric Administration. September 2014. Retrieved 2016-12-07. ^ "Are Steelhead & Salmon Returning To The Trinity River?". California Trout. 2011-12-07. Retrieved 2016-12-12. ^ O'Brien, Chip (2009). California's Best Fly Fishing: Premier Streams and Rivers from Northern California to the Eastern Sierra. Stackpole Books. ISBN 1-934753-03-3. ^ Admin, OEHHA (2014-12-30). "Trinity River upstream of Trinity Lake". OEHHA. Retrieved 2018-06-13. ^ "Boating on the Trinity Wild & Scenic River" (PDF). U.S. Forest Service. June 2012. Retrieved 2016-12-12. ^ "Trinity River Burnt Ranch Gorge". California Creeks. Retrieved 2016-12-12. ^ "Whitewater & Scenery". California Whitewater. Retrieved 2016-12-12. ^ "Gold Panning - When Trinity Turned to Gold". Visit Trinity. Retrieved 2016-12-12. ^ "Wild and Scenic Trinity River Public Access Map" (PDF). U.S. Bureau of Land Management. Retrieved 2016-12-14. ^ Source elevation derived from GNIS source coordinates  using Geoplaner. Palmer, Tim (2012). Field Guide to California Rivers. University of California Press. ISBN 0-520-95219-7. Jorstad, W.O. "George" (1995). Behind the Wild River. ISBN 1-329-42019-5. Wikimedia Commons has media related to Trinity River (California).